Now, let’s jump right into the basics – what to serve your cheese on. The bright colors of the cheese pops out even more when served on an artisan wooden board, a marble or stoneware plate. It lifts up the appearance of the cheeses but also the overall impression of the board. When you put together your cheese board, be sure to mix up your cheeses. Think about flavors, texture (soft, semi-solid and solid cheeses) and colors (white mold, blue mold, red smear and yellow cheese). Variety makes it of course more fun to eat the cheeses and to discover new pairings but it also adds visual interest to your board and sparks conversation. For your presentation, consider leaving some of the cheese mostly whole with a cutting knife beside. Others you can cut out half. Solid yellow cheese can advantageously be cut out completely, e.g. in sticks or small cubes. 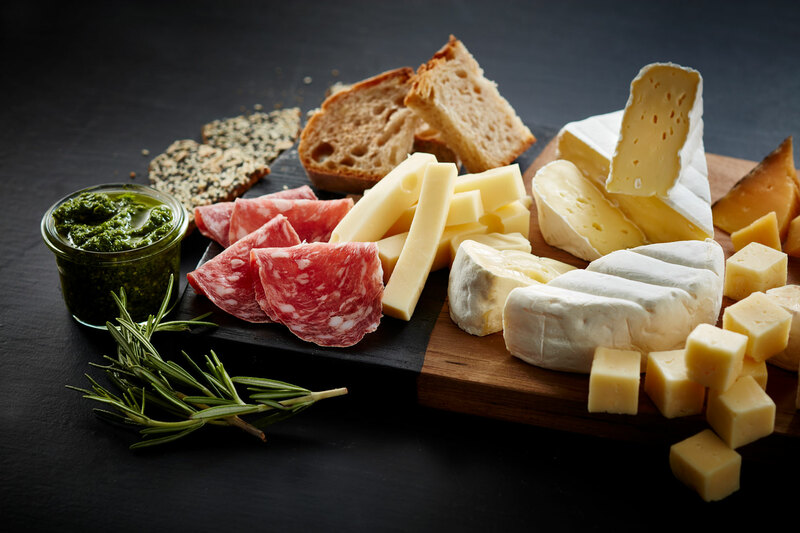 Accompaniments is what makes the cheese board really fun – this is where you get to experiment with different flavors, textures and combinations. And the accompaniments are also what can make your cheese board special – it can be simple with just a few cheeses and cured meats or you can go for the full flavor palette depending on the occasion. Serve your accompaniments directly on the board or in small bowls to fill up the negative space and visually enhance the presentation. Plum chutney, jams, figs or other dried fruits, nuts and fresh berries are excellent choices for especially blue cheeses as it balances out the bold flavors from the blue mold. A true crowd pleaser are artisanal cheeses and cured meats – the perfect duo. Choose parma ham, sausage, chorizo or similar. If you want to go with more savory items pickled onions, tomato- and basil pesto or olive tapenade are great choices. Remember, not all accessories have to be homemade, you can easily buy stylish accessories in good delis or well-stocked supermarkets. Serve white wine with your cheese and forget all about red wine! Blue cheese matches perfectly with sweet white wine or port wine. An overseas chardonnay is a good all-rounder for the cheese board. Another possibility serving beer with your cheese board. The carbon dioxide has a cleansing effect in the mouth when eating soft and creamy cheeses. White Mould cheese goes well in hand with bright Belgian beers, such as Saison or triple ales. Blue cheeses are happy with a glass of barley wine or bock. Strong yellow cheese tastes good in the company of hoppy beers such as IPA (Indian Pale Ale). And there you have it - the perfect cheese board ready for all your entertaining! Do you also want tips on temperature, how much cheese to serve and what knives to use? Check out this complete cheese board guide.